It's True, Lyme Disease Is On The Rise In Loudoun County..... I know because my 5 year old daughter was diagnosed with it this weekend. Being a country girl from Loudoun, I am pretty used to ticks being part of summer time life. I've always had pets, always been in the fields and in the woods, and always been aware of the disease that ticks can carry. When I was young the big fear was Rocky Mountain Spotted Fever. Today's fears revolve around Lyme Disease. Ticks carry these and many other diseases. Lyme disease is really not a big deal IF it is caught in time, AND TREATED APPROPRIATELY so I am writing this post in hopes that many will see it, and anyone who gets it will be cured. My daughter, a Kindergartener, was diagnosed this weekend. Saturday morning, she got a fever and was complaining of an upset stomach. By Saturday evening when I still couldn't figure out the origin of her symptoms, I admit to growing concerned. She was sitting on my lap, I was singing a silly song to her, and ran my fingers through her hair. She jumped! I pulled her hair back and this is what I saw! She quickly reminded me this is where the deer tick (about the size of a flea) had been pulled from her head. Ahh... I knew a trip to the ER was in order. Here's the scary part - the ER doc simply didn't look under her hair. 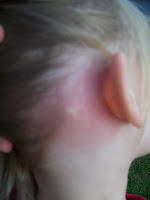 She saw redness behind her ear and thought is was a skin rash from a skin infection or allergic reaction. I had seen lyme disease before... and so I was a little pushy. Had I not asked the doc to look again, and reminded her of the other symptoms (itchy, hot to the touch, swollen, sensitive, and red around a white "bulls eye" surrounding the bite site), it would have misdiagnosed, and possibly not treated appropriately. So, I am sharing the photo and this information. Moms, trust your instincts. Blind trust can result in dangerous outcomes. Without proper treatment, lyme disease can cause all kinds of life long, and debilatating conditions. Many people don't realize that symptoms and the visual evidence can take 1-6 weeks to surface; and blood tests done in the first 30 days are often a false negative. If you find a tick on yourself or your child, write it down somewhere - perhaps on a calender. Check the bite site weekly for 6 weeks or more for visual evidence of a problem. Report the tick bite to the doctor if you have any symptoms of ANY illness you get within about 90 days (or more if you think it could be related) - there are many diseases carried by these little things, and the symptoms vary widely. Prevention is easy. The use of insect repellent and making sure your pets are treated will go far to deter this from happening to you. But the risk remains, so be diligent and check yourself and your kids after you've been outside for a while.